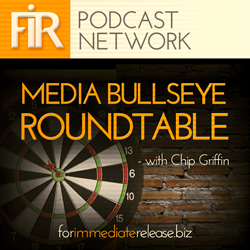 A note about the episode numbers for Media Bullseye Roundable. This is the fourth episode of 2014, hence the 2014.4 notation in the headline. —First, we dive into Chuck’s post about social media “experts” (or as he calls them, “nextperts”) and how experience and generational divides may impact the advice one gives. —Next, we discuss Gini Dietrich’s assessment of Facebook’s PR response to it’s recent research into how the sentiment of the posts included in one’s newsfeed subsequently impacts one’s own posts. —Finally, we tackle Amy Westervelt’s article on Medium where she argues that journalists should focus on journalism and not become ghostwriters and content creators for non-media organizations.